You might want to check your monthly bill, if you have satellite TV service from Bell. Jeremy Bender wishes he'd paid more attention to his. The Birds Hill, Man., man says he recently realized he'd been paying $15 a month for a personal video recorder (PVR) that he was told was included free of charge when he signed a two-year subscriber contract with Bell in April 2013. "Yeah, I should have caught it," Bender said in an interview, acknowledging he should have read the bill more closely. "Who has time to meticulously go over every item in their bill?" He calculated he had paid roughly $350 for the PVR since the beginning of his contract and asked Bell to refund the money. He said the service representative told him he"should have caught it sooner and it was my fault for not noticing it." 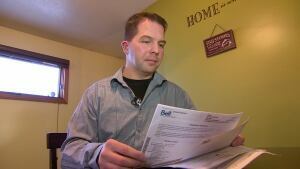 Bender contacted the CBC News I-Team after Bell refused to refund the full amount. Bell offered to pay Bender $45, which amounts to just three months' rental. The company also offered to credit his account $10 per month over the next 10 months, if he agreed to renew the contract. Not good enough, said Bender. "I have a busy lifestyle. I don't read verbatim every bill that I get, and yeah, maybe that part is my fault, but the bigger picture here is how you can only offer a fraction of what really is owing back?" Bender said. Bell spokeswoman Marie-Eve Francoeur told CBC News that customers have three months to note mistaken charges. That information is contained in Bell's nine-page terms of service document. 'If I owed a company $350, they would expect 100 per cent back or they would take me to collections.' — Jeremy Bender of Birds Hill, Man. Francoeur declined an interview request from CBC News, but said in an email, "The Bell TV plan Mr. Bender selected did not actually come with a free PVR, but it was offered by a dealer we no longer work with. Mr. Bender was offered a free PVR by the vendor." Bender said he signed up for the Bell service through a door-to-door sales representative, which Bell said is common practice in the industry. But Bender maintains the billing error was Bell's, and he says regardless of when the error was discovered, Bell still owes him the full amount he feels he overpaid. "My feelings were if I owed a company $350, they would expect 100 per cent back or they would take me to collections," Bender said. Besides, Bender said, Bell's billing practice is anything but transparent. He said the bill did not state clearly that he was paying for a PVR rental. "How do you go from an agreement that says 'rental fee' to calling it something different on the bill?" "That's not transparent," Bender said. He filed a complaint last month with the federal communications regulator, the CRTC, which can help resolve complaints between television subscribers and their customers. After the I-Team contacted Bell about the case, Francoeur said she has investigated and Bell has decided to reimburse Bender in full. Bender said he's happy to get his money back. But he's disappointed with the company's handling of the issue. "They're going to lose me as a customer. That's a guarantee. Come April, I'm done with them," Bender said. Tell us if you know about something we should be investigating. How closely do you check your bills?